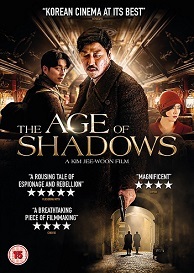 The Age of Shadows is out on DVD & Blu-ray on July 10th and to celebrate we have a great competition for you and 3 copies of the DVD to give away. The latest from the award-winning Kim Jee-Woon, The Age of Shadows is a slick, suspension-fuelled espionage thriller featuring an all-star cast. Set in Japanese-occupied Korea of the 1920s, Song Kang-ho plays a Korean police captain in the Japanese police force with a special mission: infiltrate and deceive the armed resistance fighting for independence, lead by the charismatic Kim Woo-jin (Yoo Gong). With both men standing on opposing sides, each knowing the identity and intentions of the other, a cat-and-mouse game ensues - one in which not everyone will make it out alive. Also starring Byung-hun Lee and Ji-min Han, this is a blistering spectacle from a master filmmaker at the top of his game.